This summer vacation, we headed off to Shimla to escape the blistering heat of Bangalore. Seems strange to say something like this because there used to be a time when Bangalore was the cool haven that people headed to, to seek refuge in the summers. Things are definitely changing in what was once called a Garden City - the recent thunder and hail storms are evidence enough. Anyway rambling aside, we stayed at the gorgeous Koti Resort at Baldeyan around 20kms away from Shimla. Here is a resort perched 6600ft above sea level, with every room providing you a view that you could spend days gazing at. We stayed in the premium room and had a wall to wall glass window to gaze out of. This live window seemed to change views at every time of the day. Here are just two view of what we saw for 4 days! 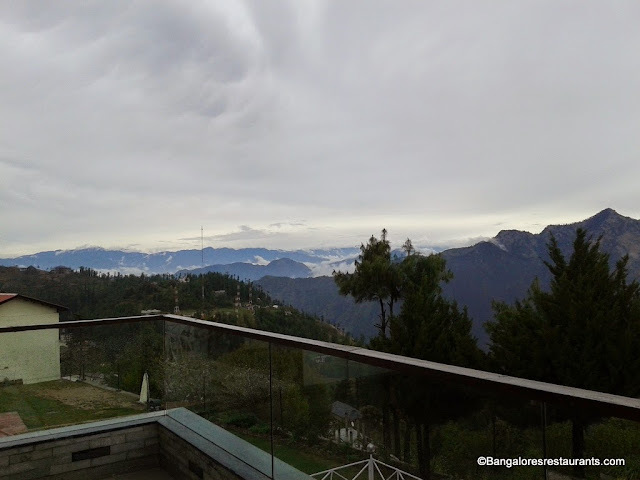 We flew in to Chandigarh and did the scenic route up 120kms to Shimla and then a little beyond to get to Baldeyan and the resort. The long journey did do us in on the day we arrived, but a very pleasant dinner was in store for us at the resort's restaurant. Temperatures dipped drastically in the evening here and we were at about 12 degrees at dinner time (yes 12 degrees is drastically low for me). Walking into the warmly lit reception we were guided to take a wooden flight of stairs up to the restaurant - On the landing are photo frames depicting the Shimla of yore, each of them holding enough of sway to make you stop and stare a few minutes. A few minutes it was, because tummies began to protest loudly and we entered the restaurant. A mezzanine floor leads to the fully loaded bar and an outdoor seating area, used primarily in the day time ensures that the gorgeous views are never too far away from sight. The restaurant has an open kitchen where you can actually step up and watch you food being prepared live. I am more used to seeing jam packets placed on a table this way. This plate was quite amusing! The presentation of the food at the restaurant is nothing much to speak of, but the food definitely is. The last thing I thought I would eat when up at Shimla was Basa fish, considering am not a major fan of this. But I like what was done to the basa. Its a fish that takes anything done it to it really well and here the treatment was delicious and kept to the minimum - a little chilli, a little lemon, a few basic spices and crumb fried. Served hot, this was precisely what we needed after the long journey and on the cold night. The meat kebabs were deliciously hot (yes, I can't stop gushing about how hot the food was. With the dipping temperatures outside, I had a renewed appreciation going for good, hot food). The meat was treated well and was moist, with a nice charcoal smokiness to it. When up north, always go in for the Dal Makhni with roti - the lashings of house churned butter made this a dish that I slurped on with a spoon, more than I did with the roti. What also accompanied the roti was a heavenly Mutton Saagwala - there is a different quality to the meat served in this part of country. The meat is richer, more tender and has a different flavour quality to it. Its close to the end of good Saag season and we made the most of it with this dish. The dinner of course had to end on a sweet note and we were served the classic Gulab Jamun (yes, warm Gulab Jamun). It did have a touch of whole aromatics in it but what really stole the show was the chasni (sugar syrup) that it was placed in. The chasni was a crystallized and was loaded with elaichi and cardamom. It added a small crunch to every bite and instantly melted in the mouth. The next morning after gushing senseless and taking innumerable photographs of the sunrise, we were told we could have breakfast out in the open where we could gaze on the mountains. Needless to say we took the resort up on the offer. The photo you see up here was taken around 6AM with the sun just peeking from behind the mountains. Breakfast at Koti Resorts is a generous mix of all things North and South. And so we had a little of both brought to the table to satiate two families from both these regions. I stuck to parathas and makkan which was thick and delicious, along with some pickle. The dosas here are served with a seriously generous amount of sambar and coconut chutney. The aloo curry to go with the puris was pleasant too. And there you have my aloo paratha! And the next morning, we had breakfast at the restaurant. It was a bit too cold for us to actually sit in the beautiful balcony and eat and so settled for taking a few pictures and getting back inside to a warm meal. On one of the nights there, the resort set up a bonfire around which we were served dinner. Great food, good alcohol, cold nights, blazing fire and a lovely family to share the pleasure with. It was gorgeous. And on one of the afternoons that we were at the resort, we were offered a traditional Himachali spread - we opted to go vegetarian since the indulgence over the past couple of days had been exceptional high. But this was a truly indulgent meal in itself. Made with an abundance of local produce, this is one that warrants post on its own. The service at Koti Resorts is very homely, efficient yet non-intrusive. Children get special attention and all their demands are personally looked into. The restrooms are spotlessly clean. A meal for two here is approximately Rs 1500. If you happen to plan a trip to Shimla soon, this resort is a great one to consider.